Professors Glen MacDonald (left) and Laurence C. Smith. 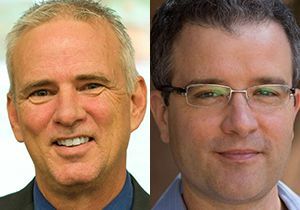 Glen MacDonald, UCLA’s John Muir Memorial Endowed Chair in Geography, and Laurence C. Smith, professor and chair of the UCLA Department of Geography, have been elected to the Class of 2015 Fellows of the American Geophysical Union (AGU). AGU’s Class of 2015 Fellows will be “recognized for their breakthrough achievements and exceptional work” in an honors ceremony and banquet at the AGU fall meeting in San Francisco on Dec. 16. MacDonald is also a professor of ecology and evolutionary biology and the UCLA Institute of the Environment and Sustainability — of which he is the former director — and the UCLA co-principal investigator for the U.S. Department of the Interior’s Southwest Climate Science Center. A particular focus of his research has been on water resources and society in western North America and the global semi-arid regions. He is known for work on the concept of the “perfect drought.” He has also worked extensively on the response of northern treeline and wetlands to climate change and ands the effects of this on global radiative balance through albedo, and carbon and methane cycles. MacDonald is the author of over 150 scientific and popular press pieces and the award-winning book, “Biogeography: Space, Time and Life” (Wiley, 2001). He speaks widely to the public and policymakers and has provided presentations and testimony to a number of California state agencies and the U.S. Senate. Among his many honors, he is a member of the National Academy of Sciences, a Fellow of the American Association for the Advancement of Science, a Guggenheim Fellow and a Rockefeller Bellagio Resident. Smith, who is also a professor of Earth, planetary and space science at UCLA, pursues research interests that include the Arctic, hydrology, satellite remote sensing technologies and climate change. He has published over 80 peer-reviewed articles, essays and books and won more than $7 million in research funding from the National Science Foundation and NASA. In 2006-2007 he was named a Guggenheim Fellow, and in 2007 and 2014 his work appeared prominently in 4th and 5th Assessment Reports of the United Nations Intergovernmental Panel on Climate Change. Most recently, he assisted the National Academy of Sciences with a major report on abrupt climate change; NASA with a new satellite mission to monitor global water resources; and the World Economic Forum with issues of Arctic development. He is frequently invited to give keynote speeches and in 2012 and 2014 was an invited speaker at the World Economic Forum in Davos. Smith's general-audience book “The World in 2050: Four Forces Shaping Civilization's Northern Future” (Plume: New York, 2011), synthesizing cross-cutting trends in natural resource demand, population demographics, economic globalization and climate change with particular emphasis on northern countries, was winner of the Walter P. Kistler Book Award and a Nature Editor's Pick of 2012. The American Geophysical Union, an international non-profit scientific association of more than 62,000 members, promotes discovery in Earth and space science for the benefit of humanity. See the announcement of the 2015 Class of Fellows here.